In this post I want to report some of the finding from a 4 month experiment with a Spark Core. 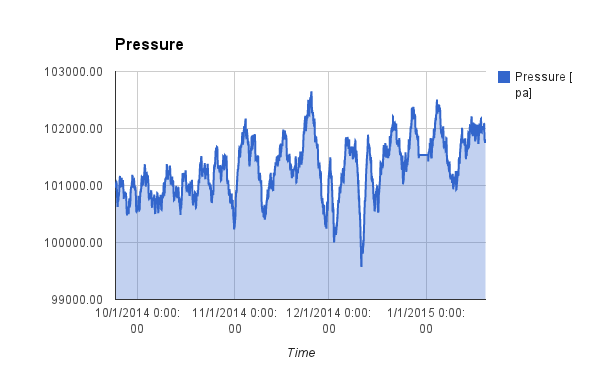 The core is uploading pressure measurement values into the cloud every five minutes. It then loggs them into a Google Spreadsheet. I use the Spark Temboo library and service after I failed to reliably poll the core from Google. After a measurement is taken the core goes to deep sleep to conserve energy. An STM103 internal HW timer interrupt is used to wake-up in time for the next measurement. Over the four month I have seen only a few corrupted values. These are most likely transmission errors due to network connectivity issues.